Since 2014, we have been proud to be accredited by the Living Wage Foundation and recognised for supporting employees by paying the real Living Wage. In an area which statistically is one of the lowest paid counties in the UK, we were Herefordshire’s first Living Wage employer. 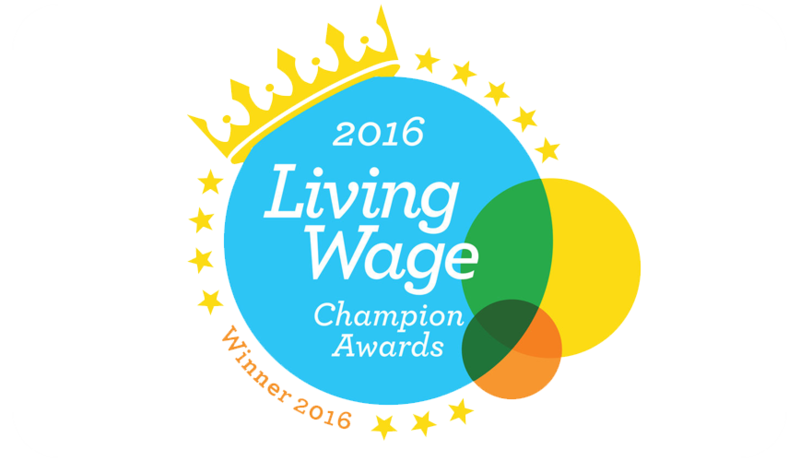 We were announced as the winner of the West Midlands Living Wage Champions awards in 2016 which recognised Living Wage employers that made great contributions to communities and industries by implementing and understanding the life changing importance of the Living Wage. Our aim has been to promote the Living Wage values both internally and externally through our social media platforms, partner companies, suppliers and the local press. Read more on the Living Wage Foundation below. I applied for the job at allpay because I knew they were a great company to work for. I knew they were a Living Wage Employer from things I had read online, but I must admit I don’t honestly know exactly what this means for me- I don’t know if it affects me directly. I am proud to work for a company that cares about their staff and rewards them for loyal service. Having completed a fixed term contract at allpay I was aware before joining of the Living Wage accreditation. It makes a huge difference to me, having an employer who looks after its employees. The advantages to me personally are working for a prestigious company, a company that looks after its employees and a company that has pioneered this accreditation in my local community. I would always want to work for inspirational companies who actively seek to be leaders of their field and put their employees at the forefront of everything they do. I think the advantages of it are that it is good for businesses, good for families and good for society. Coming from a minimum wage paid job to allpay has been a great stepping stone enabling me to start saving for the future. Now 6 + months in here at allpay I am now able to live more comfortably than in my previous job. The fact that allpay was the first Living Wage Employer did really impress me as I was applying for my role as it told me that people matter to the business and employees could expect to be treated fairly. I studied organisational culture for my degree and indicators such as employee recognition and commitment to employee welfare lend themselves to a positive working environment. In times of recession these values can be the first to be eroded but the Living Wage commitment by allpay provides a constant reassurance that staff welfare always has and always will remain a high priority. I was impressed by the Living Wage commitment and also allpay’s investment in the apprenticeship program. This had such a positive impact on me, I felt more valued by the company. But I think the effect for allpay itself has been great. Simply having the potential to think about what might actually be affordable is something I’m still getting used to. allpay was the first company that I applied to. However, I must say that knowing the company’s commitment to the living wage was definitely an important factor in my applying. I knew allpay was a living wage employer before I joined, it was part of the attraction and pull knowing that the company had a vested interest in their employees. “The difference between paying the National Minimum Wage and the Accredited Living Wage for some companies may be the difference between staying in business or not. For all others, it is the difference between what is legally required and what is ethically right. The Accredited Living Wage is set at the rate it is, for a reason. It is the real benchmark we should be measuring ourselves against. There will always be exceptions and outliers. Companies whose models can’t sustain this change yet, but for every company that can, they should."